Bright and spacious fully furnished 1-bedroom apartment (80sqm) Rue Haute, 3rd floor without elevator, close to the elevator of the Palais de Justice. 950 € + 150€ provision charges. Great place to live, very central, many restaurants and shops nearby including food markets (Delhaize and Lidl) and an organic farmer's market. Very well connected with public transport (metro, trams, trains and buses nearby). Completely equipped kitchen including glasses, plates, cutlery, etc...dishwasher, washing machine, dryer, flat iron, TV, WiFi/WLan. 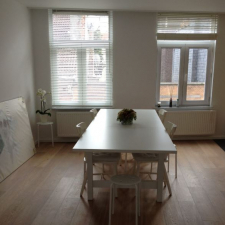 Wooden floor throughout the apartment and lots of storage place in built-in closets. Private cellar in the basement. Must see! Do not hesitate to contact me for more questions, photos or queries.